Aurora. Not the Northern Lights, although that is a spectacle I would like to witness once day, but a 1950's company that produced an interesting range of self assembly model kits that were an influence on me as a youngster. Now defunct, but a very popular brand in the US (less so in the UK) through the sixties and into the nineties, when still releasing kits under changing parent companies. Compared to the likes of Airfix, Revell, Tamiya etc, the company placed themselves in a unique position by obtaining a copyright license from Universal Studios, allowing Aurora to manufacture plastic kits in association with Universal's famous monster movies, following on with popular TV show / comic related kits. They commissioned a talented artist to depict the model kit figure on the box cover and lets just say there was artistic license with the portrayal of the actual contents! Favorites are The Creature From The Black Lagoon, Dracula (based on Bela Lugosi), King Kong holding on to a mini glow in the dark Fay Wray and of course Godzilla - my all time fav creature feature. Nowhere near as scary as a ten year old boy would hope, despite the real "glow in the dark" pieces. In fact once constructed the Godzilla figure looked like he was suffering from a bad case of elephantiasis! The Mummy kit based on Boris Karloff is slightly out of proportion as well, sporting a rather large head. No matter, as a kid I loved these kits and more so the box cover images, pouring over the cover and then the contents, afterwards enthusiastically covering my fingers in polystyrene glue and Humbrol enamel paint when constructing them. For me at that impressionable age they were evocative of the movies themselves, bridging the gap between cinema and behind the sofa fan, where perhaps a little piece of Hollywood terror could sit a on kids shelf. Inspired. The illustrator was a chap called James Bama. He was latterly famed for his portrayal of native americans, formerly, for a broad spectrum of commercial work, most famously the Doc Savage book covers. I only linked the childhood experience of these kits to the work of the artist and the Aurora company when I studied illustration at college, then of course finally understanding the role of a commercial artist - I was a slow learner (still am). These tall portrait box images are the original Bama illustration covers. 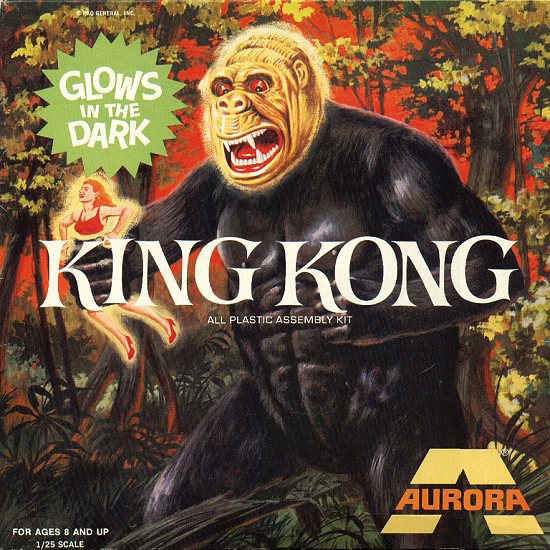 The square 'glow in the dark' covers were from a later controversial release, where the original paintings were overpainted by another artist to exaggerate the new glow in the dark kit parts. Bama's later gallery work consists mainly of delicate sensitive character studies, a million miles away from the commercial work. But for me, its the Aurora model cover art that still pleases the most due to my nostalgia driven experience of them. The way a heightened colour pallet was used for exaggerated (cinematic?) drama, how the limited printing process of the time added its own patina and how the images spurred on the imagination, long after the movie had been watched. Kitsch? Definitely, even gloriously so. But they are executed with such affection for the genre that I find them irresistible. Even though my work influences have changed significantly over the years, they still make me smile, and always will. Thanks James Bama and Aurora.